Rain! Ice maintenance: 9am, Scrape both sides. 11:30 water removal at the rink by the zamboni driver. 2:30pm, another round of moving the water with the zamboni. This was the last visit of the day. Ice maintenance: 9am scrape and flood. 1pm scrape and flood. Flurries started so at 5pm only a scrape. 8pm, the operator and staff felt that a double flood of pleasure side was a good idea, to fill in grooves. Scrape and flood (regular) of the pleasure side. Ice maintenance: 8:30am scrape and flood of both sides. 12pm scrape and flood both, 3pm scrape and flood both, 7pm scrape and flood both, 8:55pm scrape and flood both. Ice maintenance: 9am s/f both sides, 11:45 s/f both sides, 3pm s/f both sides, 7pm s/f both sides, 8.55 pm s/f both sides. Ice maintenance: 9am s/f both sides, 11:45 s/f both sides, 3pm s/f both sides the extra towel flood to fix gashes on pleasure side, 7pm s/f both sides, 8.55 pm s/f both sides. Ice maintenance: 9am s/f both sides. Snow starts. 11:45 scrape only both sides, 3:15pm scrape only both sides. Snow starts to accumulate. Zamboni driver does more frequent maintenance. 4:30pm scrape both sides, 6pm scrape both sides, 7:15pm scrape of half the hockey side, then the machine jammed. By the the farmers had left the garage, so the zamboni got washed out and by 7:55 it went out to finish the hockey side, then the pleasure side. 8:55 scrape for the permit, and then the pleasure by 9:15pm. The snow had stopped around 8:30 so the ice was great for the rest of the night. Ice maintenance: 9am s/f both sides, 11:45 s/f both sides. At the 3:15 scrape the zamboni driver realized that the fuel gauge was full of water and not working well (likely because of the snow from the night before). She filled fuel for a while, did the hockey side scrape and flood by 3:30. Half way through the pleasure side, the machine started to sputter, so the machine came off to refuel. At 5:30 the gauge seemed to be working. 7pm s/f both sides, 8.55 pm s/f both sides. Pretty busy at the rink. pre 9am zamboni breakdown due to auger damage (hockey puck) plow arrives to clear snow. 10h00 flying squad zamboni arrived scrape and flood both pads. 15h00 mechanic onsite to repair zamboni. 16h45 scrape and flood both pads. 20h55 scrape and flood both pads. Ice maintenance: Rink had a 1. a plow, 2. a case loader, 3. a zamboni. 3 or 4 Rink staff and some Recreation staff helping to make it all happen so that the rink opened around 10am. Good stuff! Much better than Saturday's snow fall where the Zamboni was used first thing (see above, it ate a puck and was out of commission till the afternoon). 11:45 scrape and flood, back to the normal schedule. 3:15 s/f, 7pm s/f, 9pm s/f. Cold day today, with a bit of snow in the am. Ice maintenance: 9am scrape and flood (even though there was a bit of snow, the ice didn't get bumpy as it normally would with snow freezing on the surface). 11:45, there was a fair bit of snow accumulated on the hockey pad, so the driver did a scrape first, dumped, then a scrape and flood. Pleasure side just got the scrape and flood. At 3pm, the second shift driver arrived, only to find that the key had been misplaced. So the driver left in search of another key, arriving back at 4:30pm. Recreation staff felt that it would be okay to put a maintenance in the middle of 13-17 shinny because it had turned to all ages anyway (low numbers of skaters, too cold?!). Just a scrape was done, the ice was in pretty good shape, again, not too many skaters had been on. At 7pm we did a scrape only, but by then the ice had been pretty chewed up and could have used a flood. It seems that if its cold enough outside, the ice cracks a little easier, so needs more touch ups with warm water. The problem was that the farmers market was on site, and the driver was not used to the protocols in place for filling the zamboni with water while parked outside the garage. The recreation staff were new at this too, so for next time we'll make it happen. 9pm scrape and flood. Ice maintenance: scrape and flood as scheduled at 9, 11h45, 15h15, 19h00 and 20h55. Ice maintenance: pre 9am scrape 10am scrape, 11:45 scrape and flood, 2:45 scrape and flood, 5:15 scrape and flood, asked for 7pm scrape, driver doing errand and couldn't make it back till 8pm. The diver didn't think it warranted a scrape this close to the last maintenance, and left. Came back for 8:55 scrape and flood. A class came to the rink from Annette School -- lots of kids, lots of skate loans, lots of happy goofing around. The teacher reminded us she'd had her class here last year when one of her students broke his leg. She had to ride in the ambulance and then later she had to make another trip to the rink to return the skates -- the paramedics had taken the kids to hospital in our loaner skates. Despite that mishap, she says she still brings her class to Dufferin as often as she can. She says they all feel at home here, that it works really well for them -- the skate loans (lots of newcomer kids in the class), the hot chocolate, the fire in the wood stove to warm up. Simple pleasures. We told her about Wallace Rink, which is right on their bus route, and which has so many of the same things. Later, around 5.30, all the little kids were chasing the puck around the ice with their parents, during the little kids' shinny time. The rink house gradually filled up with people who had come here to skate and eat Friday Night Supper. On Fridays (and lots of other days) it seems like everywhere you look, there are people talking to each other, laughing at each other's jokes -- so much friendly sociability, winter stews, hockey sticks propped up. A woman came to the staff to ask if anyone had found her little camera -- she thought she had put it down on a table, and had forgotten about it and then it wasn't where she thought she'd left it. Her friend, who'd come down to have dinner and skate with her, was helping her look in all the corners. We didn't hold out much hope, but half an hour later it turned out someone had brought it in to the snack bar. They said, "we knew it would turn up, nobody would steal at this rink." Not true, but they looked so pleased, who was going to persuade them differently? Remarkably, despite daily scenes like this all season long, some of the ice maintenance staff still seem to be unaffected by the joys of the rink. The multigenerational neighbourliness doesn't seem to register as a plus. The efforts and ingenuity of the program staff seem to irritate rather than impress them. Perhaps this is because the collegiality that might happen, in a situation where people do good work together, is missing. The ice maintenance staff have their primary allegiance to one another, not to the rink where they're placed to work. In the case of many of these workers, the silos continue. 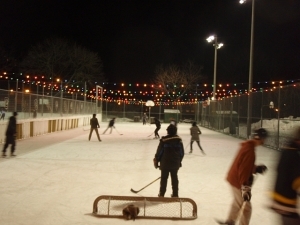 Please note: Dufferin Rink is closed all day Friday March 4 2011, for a film shoot. 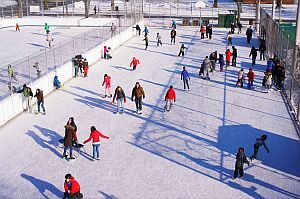 The rink is standing in for Lasker Rink in New York City. The rink will resume being open to the public on Saturday Feb.5. I'm not sure why I feel slightly appalled by Dufferin Grove standing still so it can pretend to be Lasker but I do. My son plays at Lasker - today in fact. It's a Donald Trump run place, the exact opposite of everything we are are trying to do: has nothing to do with community, is concerned primarily with liability, expensive. Plus the idea that it's cheaper to go to T.O. and fake NY than to use the real thing I find yichy. Why can't Toronto just be Toronto? Why encourage it to pretend? Why sell itself out? Allow itself to be a mere urban stand-in, the guy who looks like Brad Pitt but only from the back. I guess I do know why I'm appalled. Film permits in Toronto are free, and there's a reason for that: economic stimulation. This made-for-TV movie is called "The Twelve Dates of Christmas." There were thirty extras, with a special heated tent to house them. There must have been close to thirty film crew, including their own paramedic in case somebody wiped out on the ice. Then there were the stars, with their own named chairs (which we never saw anyone sit in). The rink house was more crammed -- with equipment as well as people -- than any of us would have thought possible. Outside, coloured lights had been strung over the whole length of the pleasure-skating rink, and an enormous light-balloon hovered over the rink, thanks to helium, to give a prettier illumination. There was dry ice all along the south of the rink, perhaps to diffuse the light some more and to make it dreamy and romantic. The rain mostly held off, and this ponderous army of film staff went through their various scenes, not finishing until well after midnight. They cleaned up amazingly, leaving only one interior row of lights not functioning, and outside -- the pretty Christmas lights, which we get to keep. Wet snow and then rain all day long. The forecast is for more of the same until Sunday. The rink had maybe 10 skaters all day, and those didn't stay long. The compressors are running all the time, will keep running as temperatures rise over the next few days. The city website is sticking to its story: 13 rinks are "operational."